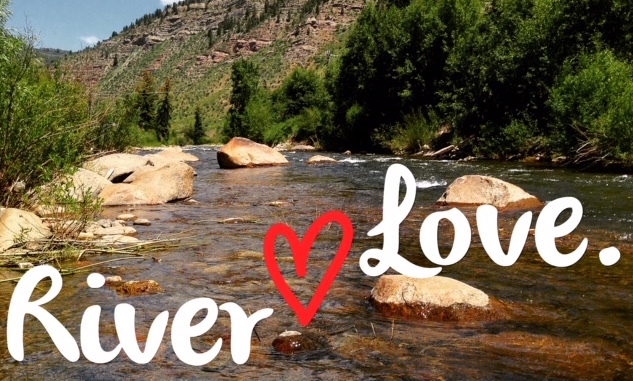 Vail river and creek health matters to everyone in our community—and especially to those who love Vail rafting. The health of our waterways is important to consider alongside opportunities for river recreation because it’s connected to the health of much more: our community’s water quality and supply, wildlife, plants, and beyond. Rafting safety is a top priority for Timberline Tours because we know that a safe trip is a memorable trip for our guests. But it’s also important for us to follow local river recreation regulations and to adopt Leave No Trace principles when in the outdoors because we care about the future of Vail’s creeks and rivers. To that end, we hope that all of our guests on the river learn something about Vail river and creek health in the process of rafting with Timberline Tours. And here are a few important things to keep in mind to protect the health of Vail’s waterways all year long. 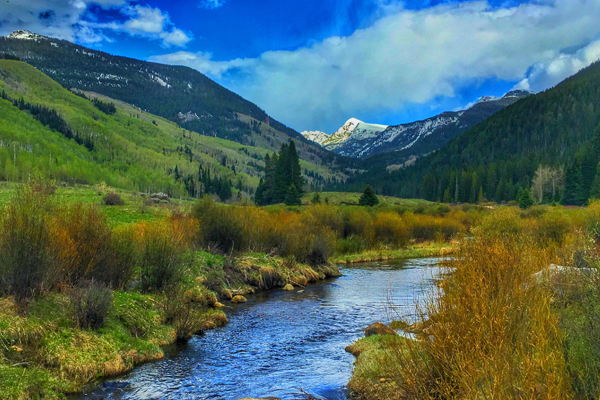 Locally, the Eagle River Watershed Council, the Town of Vail’s Gore Creek programs, and Walking Mountains Science Center all help keep Vail river and creek health in the spotlight. Educational outreach and community programs help raise awareness of factors that affect the health of our waterways. Pollution, drainage, and vegetation loss are three major issues than can threaten river and creek health. Pollution: Pollutants from land-use activities can impact waterways. These include fertilizers we put on our lawns, chemicals and soaps used for washing cars in our driveways, and soil unearthed from construction sites—anything that can potentially flow directly into water systems via storm drains without being treated first. Drainage: When water drains from impervious surfaces such as roads, parking lots, and other paved surfaces, it gets swept into local waterways, along with pollutants that have settled on top. In this way, the effect of land-use pollutants gets multiplied. Vegetation Loss: Abundant natural vegetation along the banks of Vail’s rivers and streams is a sign of health. Vegetation buffers pollution and helps slow the speed of polluted runoff as it flows into waterways. Vegetation also helps stabilize steambanks and prevent flooding. Ultimately, keeping pollution out of our waterways helps protect the wildlife—from macroinvertebrates to fish—that live there. In this way, the health of the aquatic ecosystem is directly connected with human activity. What we do—or don’t do—impacts the health of our local water resources. It’s important to be aware of how pollutants go directly into local waterways via storm drains. The Town of Vail www.lovevail.org website includes many resources for understanding more about how pollution, drainage, and vegetation relates to healthy waterways, including information about storm drains and how to responsibly dispose of pollutants to keep them out of rivers, creeks, and streams. 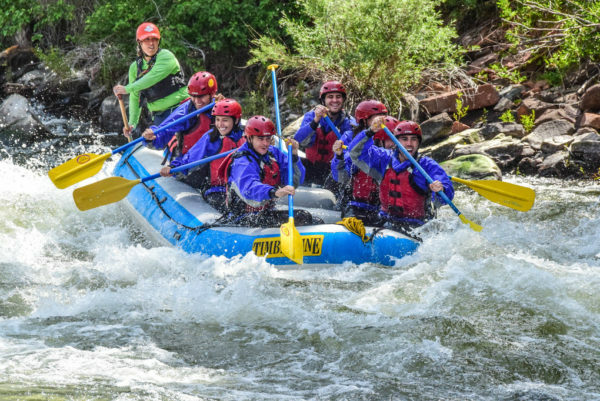 Timberline Tours seeks to respect the opportunity we have for river recreation and rafting near Vail by being mindful of how our time on the river has potential impacts on local water quality, vegetation, and wildlife. Importantly, Timberline Tours acts in accordance with commercial rafting permitting goals and regulations, and we adopt Leave No Trace principles when out on the river. As all river outfitters and river recreation enthusiasts should do, we only put in and take out our rafts at designated areas to help protect vegetation and minimize impact on wildlife. We’re also mindful of limits that help reduce the human impact of rafting, and we’re careful to report our activities as required in a timely manner. While some of the Leave No Trace principles apply to activities beyond the scope of rafting, they all help keep opportunities for recreation on Vail’s rivers and trails open for the future. When you come rafting with Timberline Tours, we hope you enjoy the natural beauty you’ll no doubt discover along the way. And we hope you join us in helping to ensure that it’s just as beautiful each time you return. Timberline Tours is the Vail-area’s premier whitewater rafting and backcountry jeep tours outfitter, also offering stand up paddle board (SUP) and duckie river trips on Colorado’s Eagle, Colorado, and Arkansas Rivers. All of our guided trips are open to Vail, Colorado visitors, locals, families, and corporate groups. To book your Vail, Colorado, adventure, call Timberline Tours at (970) 476-1414, or email us at info@timberlinetours.com.